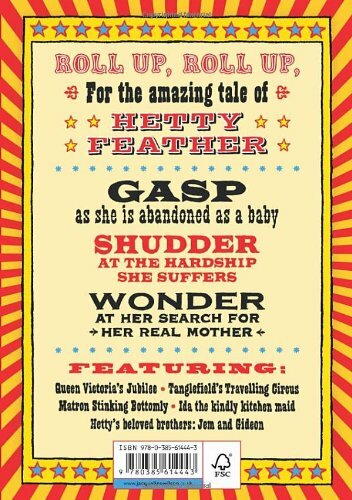 Roll up, roll up for the amazing tale of Hetty Feather. For fans of Wilson’s hitherto very contemporary tales have nothing to fear from the news that her latest book is a historical novel. What’s more, Victorian Hetty, Wilson’s newest feisty heroine, is more than a match for Tracy Beaker et al. And social problems? Well, she has them in cart-loads. Abandoned by her birth mother to the care of a foundling hospital, sickly baby Hetty is farmed out to a foster mother who raises her as one of her own. Apart from the occasional ‘paddling’ when red-headed Hetty’s fiery temperament gets the better of her, she leads an idyllic life in the country, until her sixth birthday looms. Then the dark day arrives when she must leave ‘Mother’ and the foster brother she idolises to return to the hospital. There she must get used to a very different regime: to confinement, iron discipline, and a monotonous round of hard work and lessons. Ever-rebellious, Hetty finds comfort in the kindnesses of a few friends, the stories she makes up, and memories of a childhood visit to the circus which stirs fantasies about the identity of her real mother. Then one day, Hetty runs away. But her dreams of joining the circus are quickly dashed and she discovers just how harsh the world can be outside the spartan but essentially caring walls of the foundling hospital. As a grim life on the street beckons however, Fate steps in, and Hetty Feather’s gloriously distinctive name proves her salvation. There is much to enjoy here from the thrills and spills of the Big Top to the ruses clever Hetty uses to enliven her daily grind. Wilson has created another lively and engaging heroine, who will give her eager young readers a gentle introduction to the hardships faced by many Victorian children.